Laab E-sarn is one of the excellent dishes on many Thailand restaurants menus. Though I haven’t mentioned about the restaurants in general yet, there is Laab E-sarn to be found throughout Thailand. Even the stalls, hawkers and peddlers, or even the cart food will have “Laab E-Sarn” to sell as we can see. 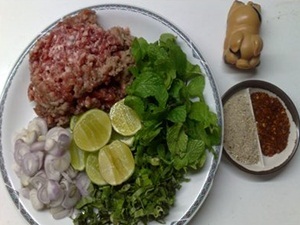 So today we will have the recipe for Laab E-sarn that is made with minced pork to present. 1. Boiled chicken broth or water in a small pot. When water starts to boil, add the minced pork and let it boils for another 2 minutes. Use the rake to separate the pork while it’s boiling. When pork is cooked, then turn the heat off and pour the water out. 2. Put the cooked pork into the medium mixing bowl, add shallots, green onion, coriander and mints (leave a little bit of mint for garnishing). Season with lime juice, fish sauce, grounded roasted rice, chili powder and sugar. Mix well. Taste and add anything as you like. 3. Put the Laab Moo on the plate and also garnish the side dishes with fresh vegetables (cabbage, long yard bean or cucumber). Sprinkle with mint leaves. Serve with hot sticky rice (or steamed rice). Note : For some people who like pork organs, you can use them as one of the Laab Moo (minced pork) ingredients too. You simply slice the organs into thin pieces and then scald them until done prior mixing them with all of the Laab Moo ingredients.